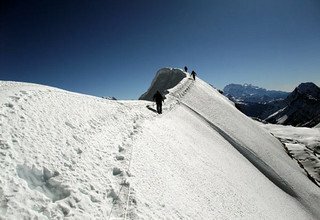 Chulu East Peak Climbing is one of the most enthralling adventures that one can venture into. Standing at an elevation of 6,429m, the peak offers mesmerizing views of the Annapurna massif, Manaslu (8163m), Dhaulagiri (8167m), Tilicho (7134m) among many others. The climb is rather technical in nature and thus requires trekkers with previous experience to take on this challenge. The diversity of this region is so rich that it makes for a truly wonderful experience. As we begin our journey in Jagat, we will be able to see the green lush beauty of the region. We will also be walking on rocky and snowy grounds crossing some picturesque Buddhist villages of the Manages, Thakali, and Gurung. This region also has a truly spectacular diversity of flora and fauna with the deep valleys creating a brilliant space for the wildlife to flourish. This region is famous for being a home to many rare animals such as the Himalayan sheep, Ibexes, and the elusive snow leopard. We will get an insight into the beauty of Manang. The Tibetan-Buddhist culture and religious practices offer the unique and exquisite taste of the predominant faith of the region. This trek will give you a sense of walking into villages that have been forgotten and will feel like you are taking a trip back to time. The climb, contrary to the tender villages offers strenuous climb and climate for the scaling. Nevertheless, the view atop the peak is absolutely scintillating and dulls the senses as long as we keep beholding the views of the surrounding. Crampons, Climbing ropes, Ice Axes all are utilized in this trek. The Chulu East Peak is surrounded by some truly magical mountains and instigates a feeling of awe while making this trek. The mystery of the mountains is best deciphered with us. With the experienced and English-speaking guides, we will take you on a journey like no other. 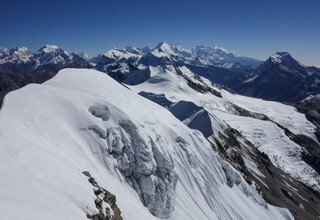 With multiple peak climbing options, feel the apex of the great Himalayas and tell your tales with Swiss Family Treks and Expedition aiding to create a lifelong experience for you. Welcome to Kathmandu! Our representative will meet you at the airport and transfer you to the hotel. You can relax or stroll around the hotel area for the rest of the day. Overnight stay at a hotel in Kathmandu. Rich in art, culture, and heritage, Kathmandu also has been a major religious hub for years. We will be visiting several of the world heritage sites in the valley. Some of the sites include a major pilgrimage site in the country- Pashupatinath, ‘the Monkey temple’- Swayambhunath and the world’s largest stupa- Boudhanath in a private vehicle. After the sightseeing tour of the city, we will transfer you to the hotel. Overnight stay at a hotel in Kathmandu. From Kathmandu, we will leave early in the morning to avoid traffic in a 4W land cruiser. The road will take us through beautiful sceneries of hills, rivers, small villages and a lot of roadside eateries. We will get occasional views of the Himalayas. We will check into a hotel once we reach Jagat. Overnight stay at Jagat. After an early breakfast, we officially begin our trek. Today, the trail is rather easier as it makes way through forested areas with small streams which we will cross multiple times. We will walk through villages like Chyamche, Tal and Karte. The trek will take place along the Marsayangdi River as it constantly amazes us with gorgeous landscapes and swerving rivers. Overnight stay at Dharapani. After an uphill journey, we will first get a glimpse of the Lamjung Himal (6983m) and the various peaks of the Annapurna massif today. This region is widely known for its hospitality you can find many tea houses along the way where people smile and wave at you. Making way through regions with prominent Hindu faith like Thoche and Thanchowk, we reach Koto. Overnight stay at Koto. We will begin our trek early in the morning as we have a long way to pass today. We will cross a river and enter the two famous valleys called the Nar and Phu. 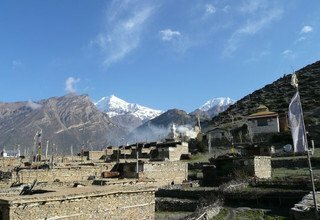 These villages are relatively remote and don’t have many services like the popular Annapurna circuit. We will pass through wooded areas, natural caves, and numerous waterfalls before reaching the village of Meta. Overnight stay at Meta. Through wooded rocky terrain, we will make our way to Kyang. We will be passing a beautiful Chorten set up by the local people as we begin to notice increasing Buddhist prevalence here. Our trek today goes through places with sparse water so make sure to take ample water for the trek. We will be following the trail along the Phu River for most of the time today. Overnight stay at Kyang. Today we make our way to Phu village which is filled with tiny alleyways and is on the base of the Himlung Himal. We can see pastures and grazing Yaks on our way to the Phu village. This region is famous for the Himalayan Sheep which can at times be seen in the rocks of the mountain cliffs. Overnight stay at Phu Gaon. We will retrace our steps back to the way we came from and take a turn at the Nar Monastery which is the only structure in that area. We will pass some beautiful Chortens and see the bunch of bamboos in the vicinity. Nar village is at a relatively short distance from the Annapurna Base Camp but we see little visitors which makes it one of the most pristine trails on the trek. 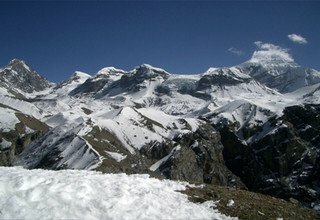 Today, we will take a trail that will again lead us to the route in the famous Annapurna Circuit. We will walk on grounds with shrubs and rocky terrain. Once we reach Kangla Phedi, we will check into one of the small lodges, which offer better menu and internet services. Before reaching Kangla Phedi, we relish the view of the Nar valley for the last time. Overnight stay at Kangla Phedi. After a brilliant sunrise view, we will walk up the winding trails to a large meadow. 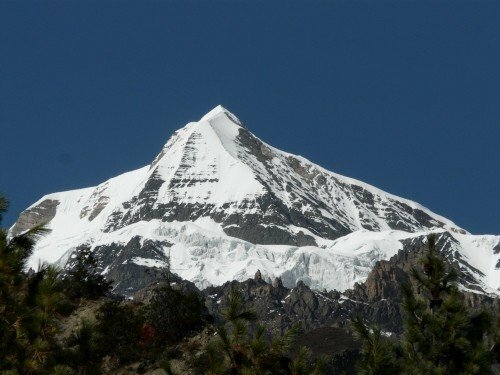 We will cross the Kang La pass (5320m) where we will see the mesmerizing views of the Tilicho Peak (7134m), Annapurna II (7937m) and Gangapurna (7454m). Following the grassy slopes, we finally reach the end of the moraine path and take a steep descent to head towards Chulu East Base Camp. Overnight at Chulu East Base Camp. Today, we will spend a day here to acclimatize and to prepare for the upcoming day tomorrow. We will make arrangement check our gear and will be given a demonstration of the do’s and don’ts. We will make small treks around the base camp with Annapurna massifs towering in the background. We will also be taking short hikes around the area to adjust better to the Himalayan atmosphere. Overnight at Chulu East Base Camp. After collecting and organizing our gear we will reach the further higher ground and get to witness a change in the terrain. This trek is a steep one and much caution is advised. We will set our camp at a place which allows us easy access to our climb tomorrow. The sunset is going to be one of the most mesmerizing ones in the journey as the sun slowly disappears beyond the magnificent Himalayan ranges. Overnight stay at High Camp. Today is the summit day and we begin the journey as early as possible while the sky is still full of stars. We will be walking on trails that open up to a snowy ridge. We will get a panoramic view of the Himalayas including Annapurna massif, Dhaulagiri (8167m), Hiunchuli (6441m) and the Manang valley on the grounds below. Getting to this point is truly rewarding after the strenuous journey that we have made. After the successful summit, we will have some time to take some beautiful photographs and make our way down to the base camp. Overnight stay at Base Camp. 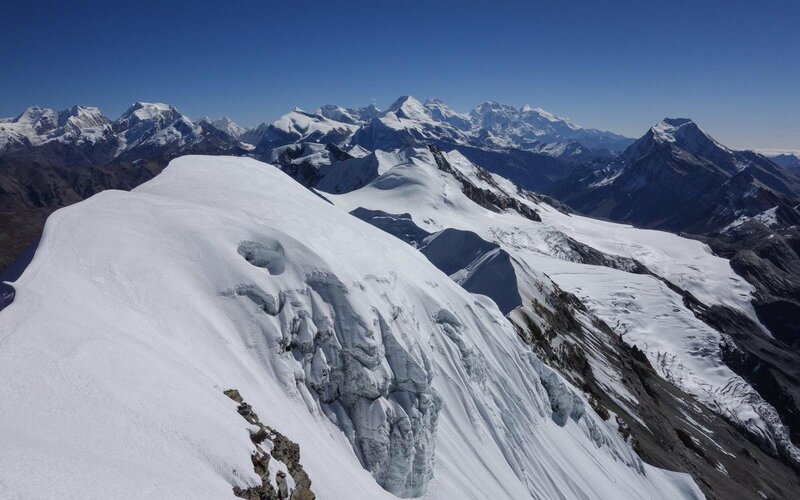 This day is kept as a backup so as to make sure that we can have an alternative day for the climb if we are not able to make the climb on the summit day due to any unforeseen reason. We will move to base camp after the climb. From base camp, we will now make our journey to Manang. As we descend we can see a gradual change in the topography and vegetation. The barren landscapes begin to reveal themselves and so do the beautiful monasteries with massive traces of Buddhism. From here we can get magnificent views of Tilicho (7134m), Annapurna range, and Gangapurna (7454m). Overnight stay at Manang. 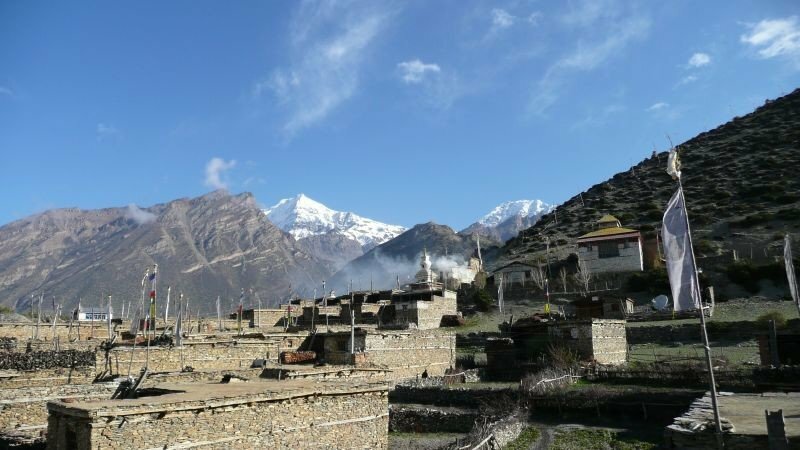 From the scenic village of Manang with its beautiful stone houses and stone paced paths, we will make our way to Tilicho Base Camp. A moderate walk, it offers beautiful scenic views and there is also a chance for bird watching here. We will be walking on the narrow path with deep and drastic valleys that can be seen below. On reaching the base camp we will able to see the Tilicho Peak towering over us. This is a rocky ascent to the lake from the base camp. We will be walking on moraines with the view of the mountains such as Nilgiri (7061m), Annapurna (8091m), Dhaulagiri (8167m), and Tilicho (7134m). We might just be able to catch reflections of the mountains in the lake. The lake is also known to be the highest lake in the world. Overnight at tented camp. An alternate route to the Throng la pass is the Mesokanto pass. This pass also marks the passage of the trekkers to Jomsom in the Annapurna region from Manang. This trek requires technical expertise so it is not recommended for the beginners. This is also called Tilicho pass and provides fabulous views of the Dhaulagiri (8167m), Manaslu (8,163m) and Annapurna I (8,091m). Overnight at tented camp. Through the barren landscape, we will make our way to the town of Jomsom which is located on the bank of the Kali Gandaki River. Fierce wind and the dry and grey dominant color give this a place a peculiar look. We will be able to see many apple and peach orchards with the trees slanting in one direction. The trail is filled will small steps and is stoned paved with beautiful houses around it. Overnight stay at Jomsom. Day 21: Fly from Jomsom to Pokhara 820m/40minutes and transfer to Hotel. Our flight is going to be early in the morning as there are strong winds during the day. Primarily, due to this reason, there are chances of flight delays and cancellations. We have appropriate plans if such cases do arise however, you will have to bear the additional costs for such services. Albeit being a short flight, this will give us plenty of time to spend in Pokhara where we will have some good food at the multiple choices of restaurants. We can also take a boat ride on the Phewa Lake and enjoy the nightlife. Overnight stay at a hotel in Pokhara. Day 22: Half Day sightseeing in Pokhara valley. Afternoon fly back to Kathmandu. With half a day at hand, we can choose to go to other places around Pokhara, such as the Davies fall and the cave adjacent to it. The Davies falls swells up during the monsoon and is a beautiful sight to witness. After exploring we will move on to the airport for our flight to Kathmandu. Upon reaching Kathmandu, you can spend the day as you please. Overnight stay at a hotel in Kathmandu. Day 23: Final Departure to International Airport. Our staff will drop you at the airport around 3 hours prior to your scheduled flight ending your journey with us. Note: In case of emergency during the trip, Helicopter will be arranged by Swiss Family Treks & Expedition. The charges must be paid by the clients themselves. * 5 nights accommodations with breakfast at 3*** hotel in Kathmandu and standard hotel in Pokhara. * Kathmandu city/sightseeing tour as per the above itinerary and entrance. * Tented accommodations with 2 persons sharing basis during the trek and climbing. * Domestic flight from Jomsom/Pokhara and Pokhara Kathmandu. * Naar-Phu Valley Restricted Permit. * Personal Trekking and Climbing Equipment.